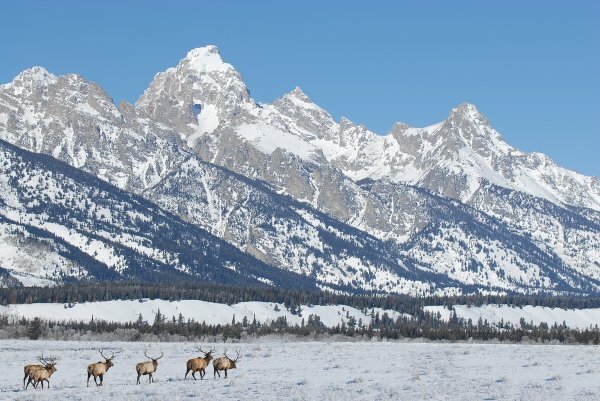 Covered in a thick blanket of snow, the Grand Teton National Park is an unforgettable winter experience. 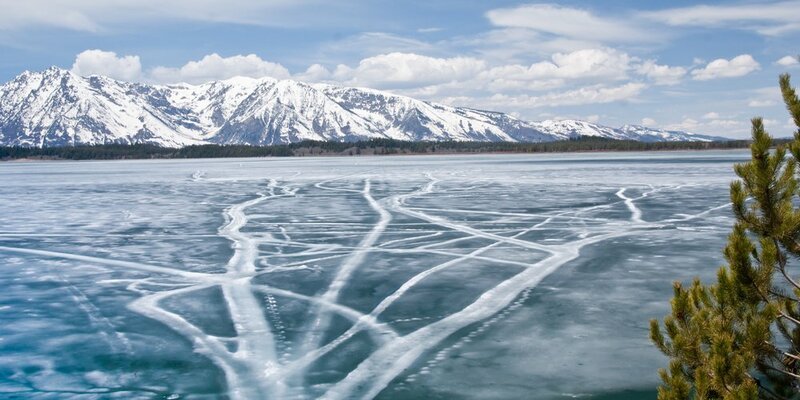 Want to escape the crowds and discover the Grand Teton winterscape like a true explorer? The stunning national park offers a plethora of exciting outdoor activities for all skill levels and ages. Set off on a guided snowshoeing tour, experience the regions most reclusive wildlife in “America’s Serengeti”, test your sense of adventure on an overnight cross-country ski trip, and much more. Located just south of Yellowstone, the region offers visitors a healthy dose of unforgettable 7,000-foot tall mountain peaks and an authentic experience in the old Wild West. At the southern part of the Grand Teton Mountain Range you’ll find the Jackson Hole Mountain Resort. With more than 2,500 acres of prime skiing this area provides the perfect mix of adventure, excitement and relaxation – from swishing down the slopes under the stars, heliskiing in untracked powder, or unwinding in one of the regions many world-class spas. Grand Teton National Park is located in the northwest corner of Wyoming, just south of Yellowstone National Park. By air, the park is most easily reached through Jackson Hole Airport. The park is also located about 5-6 drive from Salt Lake City and 9-10 hours from Denver. However, during the winter season heavy snowfall can make driving conditions very dangerous. The park’s main roadways – Highway US 89/191 and Highway UW 26/287 are plowed and open throughout the year, allowing visitors to travel from the town of Jackson to Flagg Ranch, just south of Yellowstone. Most of the Teton Park Road, also known as the “inner park road”, is closed during winter. To encourage use of public transportation, Teton County offers visitors and residents the START bus with routes throughout the region. During the winter season, most lodging options inside the park are closed and visitors typically stay in the nearby town of Jackson. The two options inside of the park are Dornan’s cabins – located on the southern end with direct snowshoe and cross-country ski access – and Triangle X Ranch on the eastern side – open just during the peak winter season (the end of December to mid-March). Both offer a rustic stay and are priced around $100-$150 a night. The latter is also an authentic dude ranch! Make sure to check out the opening times of these places before you go, however, as they have limited hours during the winter season. As well, it’s also possible to camp inside the park during the winter, but only on the plowed parking lot next to the Colter Bay Visitor Center for $5 per night from December 1 to April 15. 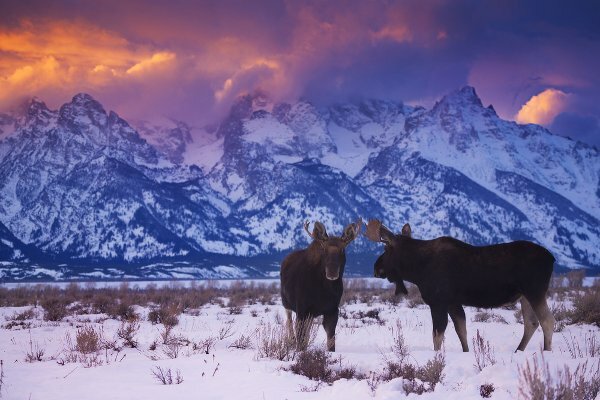 If you’re looking for a bit more variety, Jackson Hole offers a full range of options – from luxury full-service resorts to local mountain bunkhouses. Vacation rentals are a great option for the whole family as they can accommodate large groups and offer the option of a full kitchen, washer/dryer and more. For the ultimate taste of indulgence, check out the Four Seasons Jackson Hole, Snake River Lodge or Hotel Terra Jackson Hole – all of which offer exclusive slope-slide accommodation. For those on a budget, check out The Hostel which offers bunks for around $30 to $40 per night and is located right in the heart of Teton Village. 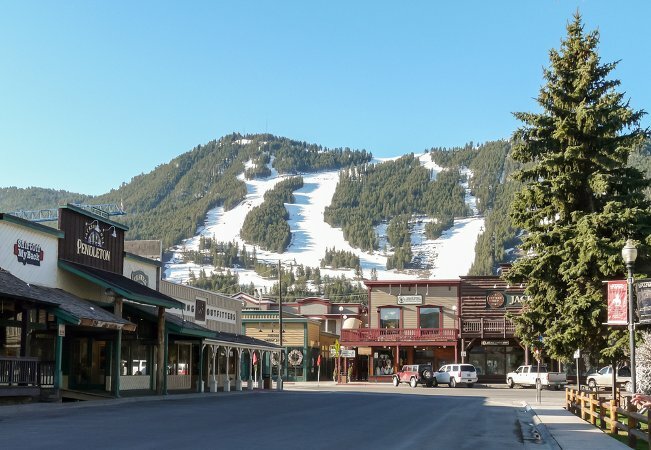 Additionally, there are many more mid-range lodging options such as the Wyoming Inn at Jackson Hole which just underwent a $5 million renovation, the Huff House Inn, offering historic charming rooms and cabins in the heart of downtown Jackson, or the eco-friendly Lexington at Jackson Hole. While the summertime in Grand Teton brings hoards of visitors, the winter season offers the unique opportunity to explore the stunning winter landscape with a certain serenity and solitude. The most popular winter outdoor activities here are snowshoeing and cross-country skiing. The park service provides a map of the most popular routes: Moose-Wilson Road, Teton Park Road and Adjacent Trails, Colter Bay, and Flagg Ranch. You can opt to venture out on your own or join one of the many guided tour options. 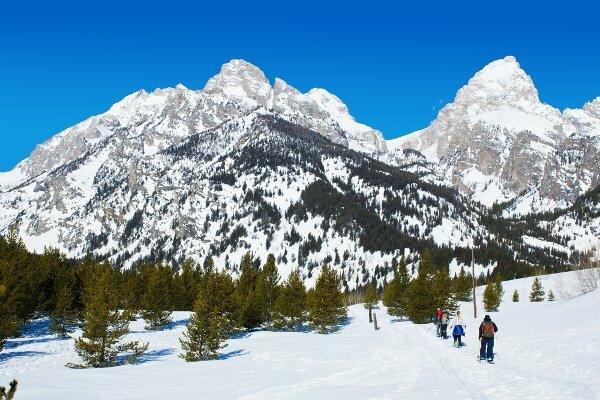 Jackson Hole Mountain Guides for example offer a number of options for guided outdoor exploration such as back country skiing and riding, ice climbing, ski mountaineering as well as single and multi-day trips. Exum Guides also offers similar activities to JHMG, as well as avalanche courses and ski and snowboard camps. To explore the majestic wildlife Grand Teton has to offer check out one of the tours from Hole Hike.  Choose from a variety of options including: snowshoeing and wildlife tour, cross country ski tour, showshoe and elk/sleigh tour and snowshoe and dog sled tour. There are also a number of multi-day treks available as well. 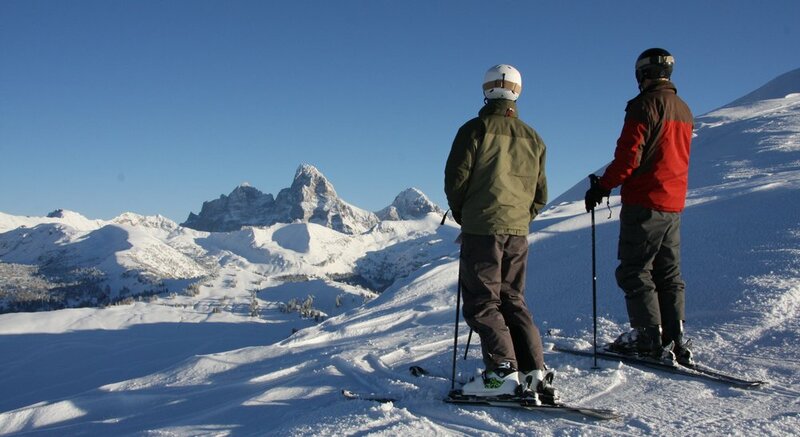 And definitely don’t miss out on the world-class slopes at Jackson Hole Mountain Resort. Just recently, Forbes listed this place as the #1 Ski Resort in North America! With 133 (named) trails including a mix of 50% expert, 40% intermediate and 10% beginner, more than 2,500 acres of terrain and a 4,139-foot vertical drop there are options for the whole family. Check the interactive map here. 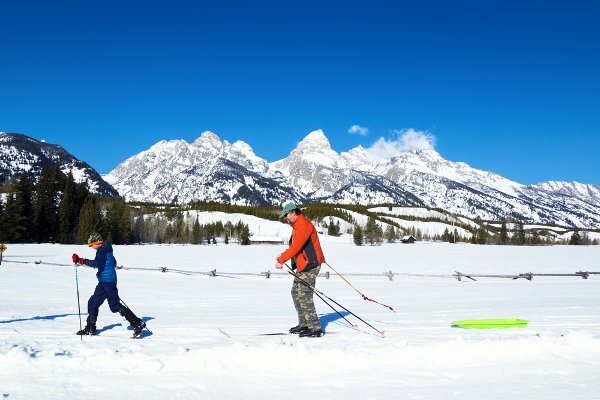 In addition to the slopes, Jackson Hole also offers tons of outdoor exploration options from snowmobiling to sleigh rides, wildlife tours to winter bike adventures, ice skating to tubing on the epic Snow King Mountain. Jackson Hole also offers plenty of opportunities for some much needed relaxation and refuelling. Check out one of the many world-class spas. For a dose of culture, Jackson Hole is also home to a number of impressive art galleries and museums featuring stunning works from international artists (on sale for a hefty price, of course). Inside Grand Teton National Park only one place is open to eat during the winter season: the Pizza Pasta Company at Dornan’s. For some more variety head a few miles down the road to Jackson Hole, offering all types of cuisine on any budget such as fresh, spicy Mexican from Merry Piglets to authentic local favourites from Casper Restaurant. Check out a list of the featured mountain dining. 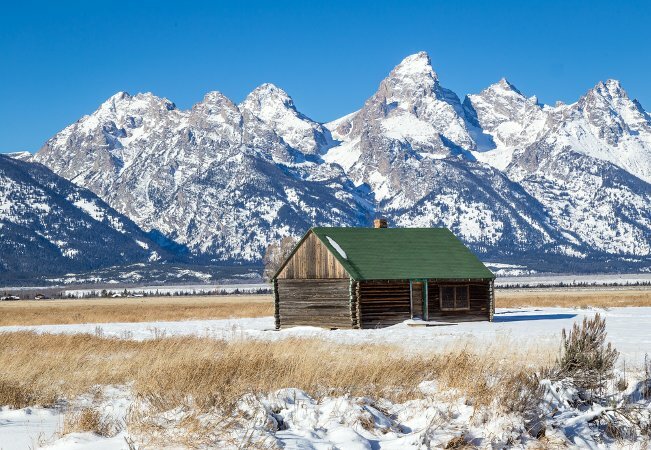 With something for everyone whether it’s rustic exploration of the staggering peaks in Grand Teton National Park or racing down the well-groomed slopes of Jackson Hole Mountain Resort, a winter weekend in Grand Teton is a must-do, once-in a lifetime experience!